Conservatives have tried to argue that the problem state and local governments face is that the public-sector employees have used union power to pull away from the rest of us. What has really happened over the last 30 years is almost the opposite. Since the end of the 1970s, the policy changes that got into full swing under Ronald Reagan have actually pulled the bottom out of the private sector. The public sector isn’t pulling ahead –the private sector is falling behind the standard that it long provided. 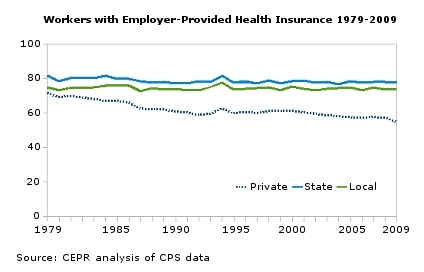 As an example, the figure here shows the share of workers in the private sector and in state and local governments that have employer-provided health insurance where the employer pays at least a portion of the premium. In 1979, the earliest year of data available, the private, state, and local sectors were not far apart. (Then, as now, state and local employees tend to be older and have more education, two factors that are highly correlated with better pay and benefits.) Over the next 30 years, the health-insurance coverage rates remained essentially unchanged for state and local government workers. But, the share of private-sector workers with employer-provided health insurance fell more than 15 percentage points –from over 70 percent to just under 55 percent. State and local workers have been much more successful at retaining their benefits than private-sector workers. They have made concessions, including paying a higher share of their premiums, higher deductibles, and higher copays. But they have largely been able to maintain coverage for themselves and for their families. Private-sector workers, however, have had the rug pulled out from under them –by private-sector employers. The higher unionization rate in the public sector has undoubtedly played a role. Over one-third of public-sector workers are in a union, compared with only about seven percent in the private sector. But, the union role has primarily been to hold state and local governments –and the much smaller share of unionized private-sector employers– to the standard that these employers met before the 30-year assault on the American middle class that began in the late 1970s.